Ninety photos cover sixty years of contemporary Brazilian history in the ‘Eloge du Vertige’ show, held at the MEP (Maison Européenne de la Photographie) – an exhibition that poignantly portrays Brazil’s search for identity during periods of immense political and economic instability. After Gerlado de Barros’ 1950’s ‘figurativism’ and the military propaganda of the Years of Lead (1964-85), Brazilian photography took on new dimensions in the eighties, notably thanks to photographers Claudia Andujar, Miguel Rio Branco and Mario Cravo Neto. Free from the shackles of censure (or almost), and with increasingly affordable cameras, experimentation became the norm, and a precious means of defending Brazil’s multiculturalism. 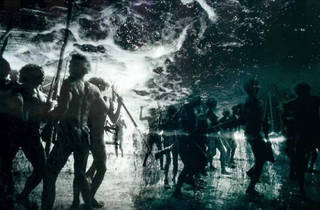 ‘Eloge du Vertige’ is a unique and wholly poetic exhibition – a must-see at the MEP from 18th of January 2012.